The Samsung NX20 has one of the highest resolutions of any hybrid camera on the market, with a 20.3 megapixel CMOS sensor (only the Sony NEX 7 sport the last 24 Mpix Sony sensor). Among APS-C cameras there are a few 24 Mpix models available, all of which are SLR (Nikon) or SLT (Sony). The specifications are good, the camera offers an excellent range of functions as you would expect. There are a few things that could be better: the video capture is at 30FPS and higher rates can only be recorded when the resolution is reduced to VGA (640×480) or lower. The monitor is not very high resolution either at 614k. However the video is full HD and the screen is fully articulated. The NX20 does have quite a comprehensive connectivity system with built in Wi-Fi. The system allows you to connect to a smartphone for sharing and to use the phone as a controller or even a remote viewfinder. You can also connect directly to the web if there is an available hotspot, to upload images direct to Facebook or other sharing sites and, via ‘TV Link’ to other devices such as a TV for viewing. Samsung appears to be using its experience in mobile technology to add interesting functionality to its cameras. There is a range of lenses available from Samsung covering focal lengths from 16mm to 200mm, (the relative focal length for full frame 35 mm is x1.5 so this range is effectively 24mm to 300mm). At present there are no independent lenses available for the Samsung NX mount. The Samsung NX20, with the specifications it has, with the RAW capture and manual overrides on all of the automatic functions, is clearly aimed at people who are serious about their photography. It is also fully automated so that you don’t need to know all the finer details of picture taking but it will allow you to be creative if you want to be. 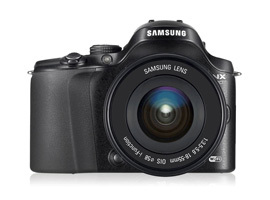 The Samsung NX20 has a very good DxO Mark Score: 75 overall makes it the 5th highest scoring hybrid camera. The Portrait score of 23.4 bits gives it the same rank for color depth. In Landscape at 12.9 EV it is joint third for dynamic range. The Sport score of 785 ISO is less impressive but it is still in the top third of all hybrid cameras. The term ‘Hybrid’ covers quite a wide range and the NX20 is placed very well in the group. If you make the group bigger and include all APS-C cameras then the results are still very creditable, the Samsung is joint 15th of the group, yet it is well down the scale for price. This chart shows all APS-C cameras, SLR, SLT and Hybrid (excluding the most expensive). It shows just what good value the Samsung NX20 is: there is only one higher scoring camera that is cheaper, the Nikon D3200, which scored 81 and one camera that matches the NX20’s score, at a fractionally lower price, the Sony Alpha 57. Among this small selection of Hybrid cameras the comparison that really stands out is that the Samsung is the cheapest and has the highest Mpix. It scores slightly lower but not by very much: 75 for the NX20, 78 for the Sony NEX-6 and 79 for the Pentax K 01. The individual measures are very close too until you get to the low light score where the Sony scores 1018 and the Pentax 1135 against the 785 for the NX20. The specifications are very similar too, each camera excelling in some respect: The Samsung for instance has the largest sensor, the fastest shutter speed (1/8000th), and the only Wi-Fi connectivity. The Sony NEX-6 has the highest capture rate at 10 FPS for stills and is the lightest of the three whilst the Pentax K 01 has the best sound recording for video (and the highest overall score). There is a similarity between these three hybrid APS-C cameras that suggests that each manufacturer is getting as much as possible out of the technology. In terms of size and styling the NX20 looks a little like the Lumix DMC GH3 or the Olympus OM-D E-M5, both of these are 16 Megapixel, Micro 4:3 hybrid cameras with DxO Mark scores of 71 and both are more expensive than the NX20. While the Low Light score for these two is fractionally better than the Samsung they fail to match up to the NX20 for either Color Depth or Dynamic range. Given the lower price it seems like opting for the Samsung NX20 in this comparison is inevitable if only IQ is taken into account. The measurements are so close: at 800 ISO the results are virtually the same. Not what you would expect since the Samsung is significantly cheaper. This price bracket in the market is very crowded, nearly all brands have several models aimed at slightly different sectors of the camera buying public. The Samsung NX20 is one of the best available hybrid cameras for the price, but there are alternatives at a similar price that bear comparison. The Nikon D3200 is a case in point. It is an SLR camera with an even higher pixel count than the Samsung: 24 MPix. It won’t capture at the same rate as the Samsung: 4FPS rather than 8 but all of the measures are better, with the overall DxO Mark score of 81, 6 points clear of the NX20. For the sake of balance, it is also interesting to see that Samsung has made a huge improvement over their last model: the NX200. The Samsung NX200 which has been on the market since the middle of 2011 also has a 20Mpix sensor and scored well with a DxO Mark score of 69. It is better than some much more expensive cameras but the NX20 has beaten it in all respects. Where there is enough light for a reasonable ISO the Nikon wins and the Samsung NX 200 is just beaten by the NX 20. The Samsung NX20 is a very good camera; it is good value for money well specified and produces larger image files than anything that is directly comparable. If you want a camera that will capture pictures and share them quickly and easily then this could be one of the best possible choices you could make. However, if you want a ‘system’ with a range of lenses then you need to make sure that the lenses you want are available in the Samsung selection. It is also worth noting that for less money you could have the very good Nikon D3200 or for just a little more money the extraordinarily good D5200: with the huge range of lenses available for Nikon, both Nikon’s own and independent manufacturers, plus the huge market for second hand lenses: this might be a better option.